As commercial real estate spending for online marketing continues to rise, companies must carefully evaluate the best approaches for their business needs. Two popular tactics with application for corporate and property marketing are search engine optimization, or SEO, and search engine marketing, or SEM*. SEO leverages the potential of “free” search--the natural, organic search results that appear, for example, in the main, lefthand column on the page of search engine Google when someone searches for companies or properties. The results link directly to Web sites with content that best matches the searcher’s request, as interpreted by the search engine’s algorithms. These listings can’t be bought; you have to earn your way up the rankings based on the relevance of your web site’s content, depth, frequency of update and--crucially--the number of third-party sites linking to yours. While it takes time and effort (a cost to your company) to earn high placement, when someone clicks on your naturally ranked Google listing on a search results page, Google doesn’t charge you a fee. Both SEM and SEO require a long-term, continual comm itment to testing and refining techniques for improved rankings, but can reward those making the investment with a steady stream of high-quality prospects. As tenants, investors and brokers increasingly begin their search for commercial properties with a search engine query, the importance of mastering this marketing channel is growing rapidly. As your company develops its strategy to benefit from these alternatives, you might start by searching for your property listings or services on Google or Yahoo! and see where you rank today. 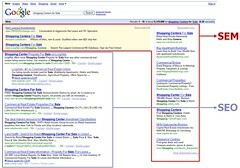 *Note: some people use SEM to refer to all forms of search engine marketing, inclusive of search engine optimization. In this post, I am using it to refer specifically to paid search.